The Community Screening Kits, provide everything you need to organise and host a Screening in your area – no matter how big or small. Scroll down, and click on a type of Screening to register your interest, or “Look Inside” for more information. The answer to a sustainable future, lies in the actions of today. The Community Screenings and FireCircles are part of creating resilient, healthy communities. Set up a screening in your local community, and use it as an opportunity to bring people together. From a simple screening to community-led discussions, circle gatherings, and longer events – think skill-sharing, talks and workshops, perhaps a bring-a dish dinner… whatever will feed your community, it’s yours to create! Screening a film can be a powerful community event, and we want to support you in making it happen. We have created a Screening Kit to guide you, based on our experience coordinating and hosting over 60 screenings on the 2016 Community Screening Tour. All screenings are strictly not-for-profit, and any profit should be donated to locally based projects, rooted in the permaculture principles of earth care people care and fair shares. To register your interest in organising a Community Screening Event, please contact us. Who you will invite and how will you invite them? Who will help you to plan and hold the event? Please feel free to dream and plan into your event, we will be in touch very soon! Why do we charge screening fees? Wetheuncivilised A Life Story is a grassroots project – it has been made without the support of a broadcaster or any other big funder. It is also a not-for-profit venture. 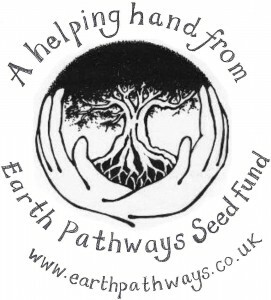 It has been made with the unpaid and underpaid labour of many people and with financial contributions from a wide range of supporters from individuals in the immediate and wider community, to the Seed Fund and the Lush Charity Pot, alongside Pete and my dedication over the past 4-years to the project, without paying ourselves. The cost is based on the cost of the Kits to make, and our time. Over the 60 screenings on the 2016 tour, with donations on the door, each screening usually made between £100 and £300 (on the tour, we split it 50/50), so you should easily cover the cost of the Screening Kit. We want to make sure the film continues to reach wide and far, and your contributions will enable this project to continue to flourish. 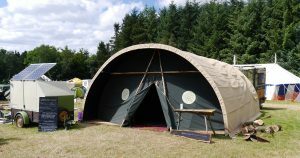 For larger events, we are offering use of the Solar-powered Cinema Tent and full PA system as a space to show the film, and as a collaborative learning space. The tent can be used to host the community events, allowing people to share knowledge and cross-fertilise ideas, and also for a bit of live music after the film! Alternatively, you can screen the film in a local venue of your choice (we can provide the PA system/projector ). We will come along, and get involved, offering a Q&A, facilitated group discussions, and anything else you think we could help with!